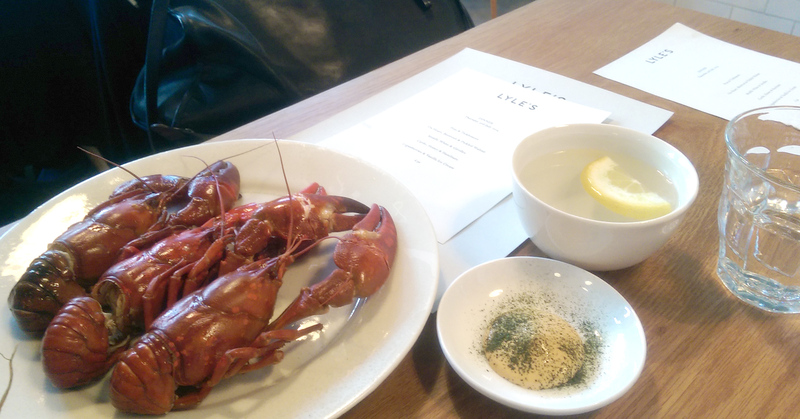 We started off with two snacks – samphire coated in delicious freshly churned butter and a whole crayfish each with home-made mayonnaise. The starter was probably the stand-out dish of the night, hence its role as the star photo above. Fresh, al dente and flavoursome peas, with pea flowers and ticklemore. 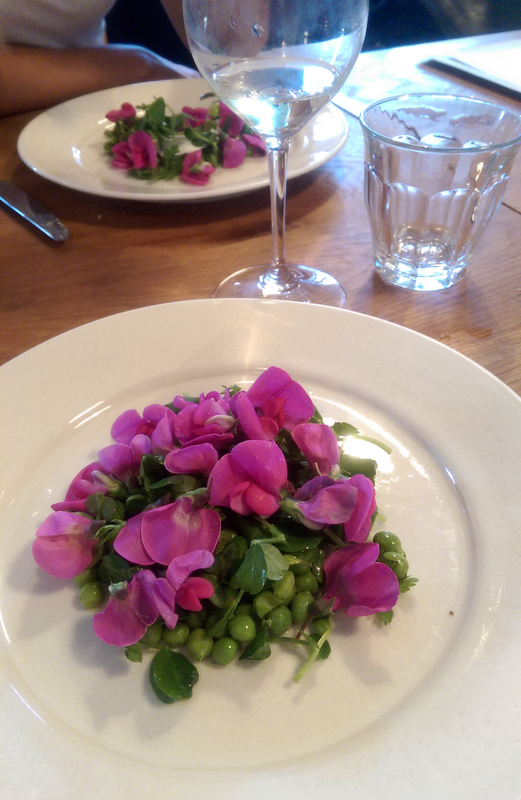 The pea flowers not only looked beautiful but added an extra piquancy to the dish. I didn’t have the cheese but I understand it was similar to feta in flavour and the richness went really well the with crisp taste of the peas. 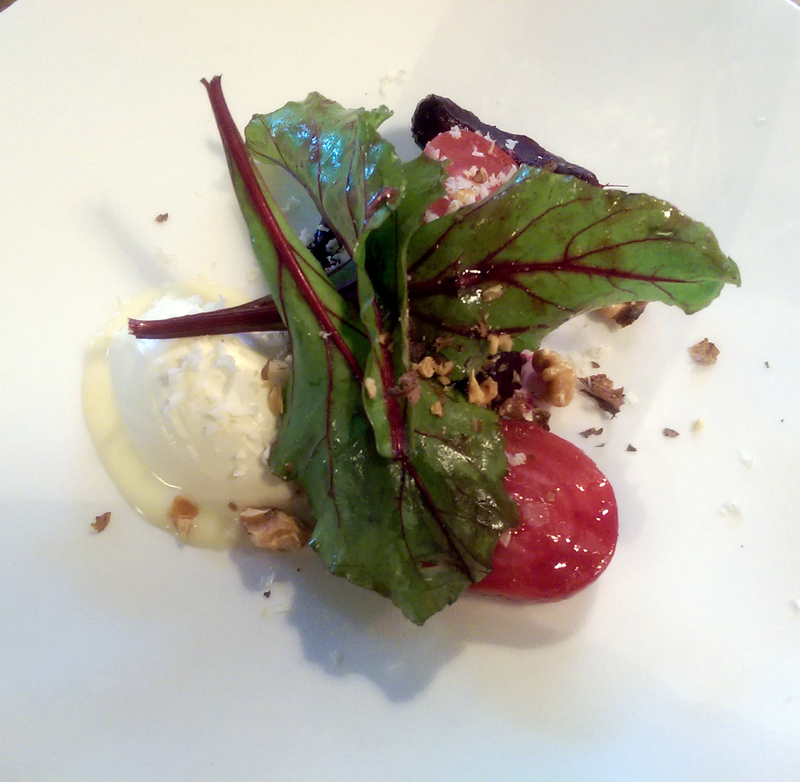 The next course was a tart thick sour cream (ox heart for the girls) with earthy beetroot and pickled walnuts – delicious. 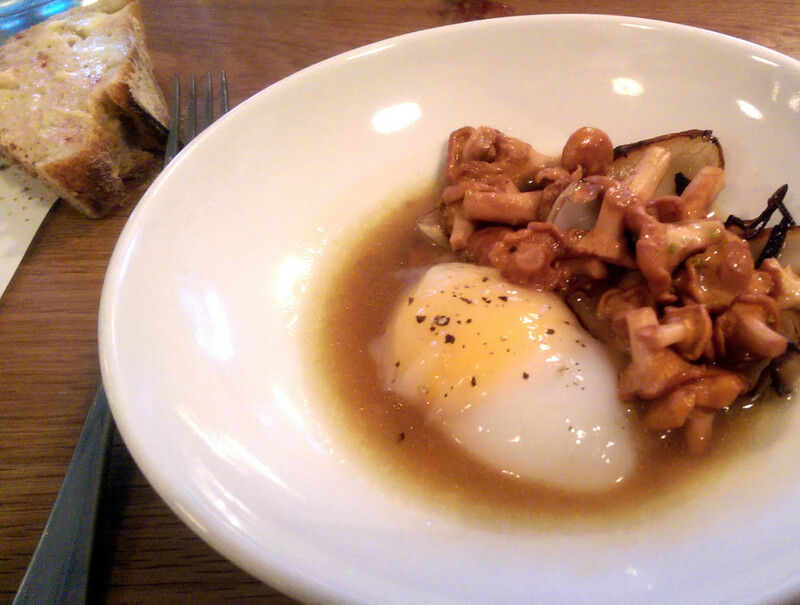 For my main I had a sous-vide duck egg served with girolles and a delicious broth. The duck egg was so rich in flavour and the semi-solid texture from its having being cooked in a water bath meant it was unlike any egg I’d eaten before. The girls had middle white pork with their girolles…and I think the comment from one of them that ‘even the fat tastes amazing’ said it all! My two desserts didn’t differ wildly from each other in appearance (though that probably serves me right for being fussy about cheese) but were both delicious. The stand out pudding for me was the gooseberry sorbet with elderflower meringue…two really delicate flavours but they came through so clearly in this dish. The meal ended on an amazing note with a mini butter cake – fresh out the oven these warm, rich little cakes were to die for. The restaurant (situated in the old Tea Building) is light and airy. Thankfully none of the the pretentiousness associated with Shoreditch gets a look in, so the atmosphere was really relaxed. There was a long wait between courses but as the food, when it eventually came, was so delicious and the staff so friendly this didn’t affect our meal too much… although if you like your food in a timely fashion, however, this might not be the place for you. 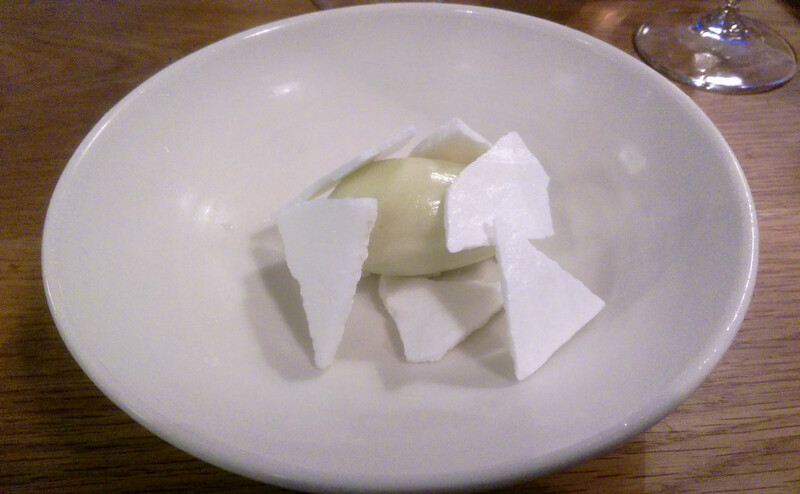 This entry was posted in eat and tagged London, Lyle's, Shoreditch, United Kingdom, Young Turks. Bookmark the permalink.